Collision mitigation systems for trucks are becoming increasingly popular as they offer enhanced safety features, register fewer false activations and set the stage for increasing autonomous capabilities. When these systems first were introduced, there were many false positive results and unnecessary emergency brakings, said Art Trahan, Ryder’s senior manager assigned to national accounts. But the collision-mitigation products offered by the three suppliers — Bendix Commercial Vehicle Systems, Wabco and Daimler Trucks North America — have been improving. As a result, more of Ryder’s fleet customers are using them. “It’s getting to be more and more the norm,” he said. “I don’t think we’ve pushed over the 50% mark because like everything else, there’s a cost involved,” Trahan added, noting medium-duty has a lot less penetration but is picking up. Now that the systems are standard with many manufacturers, Trahan said some fleets are reluctant to opt out. They don’t want to explain to a jury why they chose not to install a system that could have prevented a crash. Installing automatic emergency braking systems on all existing and new trucks with gross vehicle weights of more than 10,000 pounds would prevent 5,294 ­crashes, 2,753 injuries and 55 deaths annually, according to a study published in September 2017 by the AAA Foundation for Traffic Safety and authored by the Virginia Tech Transportation Institute. Volvo Trucks became the first North American manufacturer to make the Bendix Wingman Fusion a factory-built standard on its highway models, which it integrates through its Volvo Active Driver Assist system. Ashraf Makki, product marketing manager for technology, said the only call he has received regarding false positives was from a dealer, and in that case the radar simply needed to be calibrated. “Those false positives have been reduced drastically with the addition of the camera,” he said. Volvo has added a right-hand blind spot radar and is adding road speed sign recognition that will alert the driver if the truck is traveling 5 mph over the speed limit. At 10 mph over, it will perform a quick dethrottle. The feature will be available at the end of the year. The latest systems represent a significant improvement from earlier generations of the technology, experts said. The first vehicle onboard radar products (VODAR), were so likely to sound a false alarm by bouncing off bridges and other objects that some called them a “bridge detection system,” said Fred Andersky, director of customer solutions-­controls for Bendix, which now owns the product. That was a problem for drivers. “If you’re driving along and you’re kind of having a nice day, and all of a sudden the truck puts on the brakes for no reason, if you’re a driver, that is not a good thing to have happen,” Andersky said. The newest systems are much better. Bendix offers its Wingman Advanced, which features a radar with adaptive cruise control and braking. The Wingman Fusion system adds a camera that works in conjunction with the radar. It can apply roughly two-thirds of the available braking power and will pulse air back to the trailer. Because it can determine the nature of the obstruction earlier, it can reduce the speed at impact by 35 mph versus 25 mph with the Wingman Advanced. Adding the camera also reduced false activations. The take rate this year is running 4-to-1 in favor of Wingman Fusion over Wingman Advanced, Andersky said. Fleets see value in collision mitigation technology, he said. “We’ve seen fleets go as high as 70-90% reduction in the number of rear-end collisions that they’re having, or that they had been having, and even a reduction upwards of 70% in the severity of the remaining rear-end collisions that they still had,” he said. Despite the advances, at least one fleet has run into problems making the systems work with bumper guards. Brian Stewart is director of maintenance for Columbia, Miss.-based Jones Logistics, whose routes cross rural areas with large populations of deer and other wild animals. One year, he had 29 deer accidents, many of which caused significant damage to his trucks and one of which injured a driver’s spleen. In response, the company installed bumper guards on all of its 160 trucks. Last year, his trucks suffered no deer-­related damage. Stewart said he has not been able to find any combination of collision mitigation system, truck and bumper guard that functions properly. After two years of trying, he finally removed the systems. Instead, Jones Logistics is installing inboard and outboard cameras to improve driver safety habits. “Due to the lane departure constantly going off and the collision mitigation saying there’s something in front of the sensor, we just can’t get it to work, so we’re going the training route right now,” Stewart said. Addressing Jones Logistics’ issues, Bendix’s Andersky said the company describes in its service data information what clearances are needed with metal guards. Also, missing latch pins can ­vibrate, affecting the system’s performance. But with proper clearance and installation, fleets should be able to use both collision mitigation systems and bumper guards. Jon Morrison, Wabco’s president of the Americas, agreed that proper mounting and clearance are the keys. As to other developments, Wabco first launched its OnGuard system with active braking more than a decade ago, in December 2007. It currently includes a 77 gigahertz radar. Morrison said Wabco’s system can decelerate from 25 mph to zero, while an upgraded version can go from 35 to zero. Wabco will be adding a camera that will further expand deceleration capabilities to from 50 to zero. That OnGuardMAX system will be available in early 2020. Wabco is making other additions to its product line. It launched in Europe and is preparing to launch in the United States its TailGuard product, in which an active braking system at the vehicle’s rear will activate if it detects an object during a backing maneuver. Radar sensors and lidar ­systems will be used for the company’s OnCity, an urban turning-assist system that will include a warning as well as braking features. It is meant for low-speed and turning situations to prevent accidents with pedestrians. Wabco’s ADOPT system is being tested in China and will surround the truck and trailer with radar-camera solutions. “What we’re trying to do is assemble the building blocks of these various technologies and sensors that we bring in ­together from an integration point of view to create kind of a 360-­degree protection around the vehicle,” Morrison said. Of the truck manufacturers, only DTNA produces its own proprietary active safety system. Brian Daniels, manager for Detroit powertrain and component product marketing, said DTNA’s Detroit Assurance 4.0 has a 75% take rate with new Freightliner Cascadia trucks, in which the system is standard. It can track up to 40 objects simul­taneously as far as 820 feet in front of the truck and identify the six most threatening vehicles. Its video unit refreshes calculations 200 times per second. The system can detect most pedestrians as long as they are moving and can brake at vehicle speeds below 25 mph. The cruise control system is preset to maintain following distances of 3.6 seconds, but it can be adjusted. 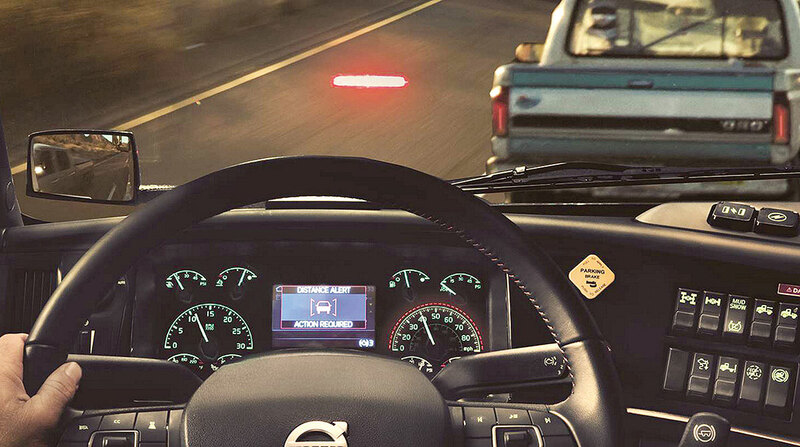 Visual dash alerts will appear if the driver is traveling too close to the vehicle in front of it. At Navistar, Bendix’s Wingman Advanced is the standard offering, said Darren Gosbee, vice president of advanced technology. But only 10% of highway fleet customers are choosing that option. Another 40% are up-spec’ing to Wingman Fusion. Another 20% choose Wabco OnGuard. Technology improvements have reduced false activations quite dramatically, Gosbee said. “We are not reducing system perfor­mance by removing these false positives, but what we’re doing is actually removing the unwanted alerts, so the systems are actually getting better,” he said. Gosbee said the technology that makes collision mitigation systems possible is a stepping stone to future greater automation, with full longitudinal control possible in 24 months and latitudinal control in three to five years. Advanced driver assistance systems (ADAS) represent the greatest churn in the industry, he said. “There’s always the next widget that can leapfrog ahead of the competition, and those guys are very good at it,” Gosbee said of the suppliers. A National Highway Traffic Safety Administration mandate that all new Class 7 and 8 tractors must be outfitted with electronic stability control systems went into effect in August 2017. The agency is studying a mandate for forward collision mitigation systems. Ryder’s Trahan predicted the systems eventually will be mandated. Paccar and Mack Trucks declined to comment for this ­story.